It’s true that team work DOES in fact make the dream work, but the question I wanted to answer was why, and how…? In a dog eat dog world, where every one is fighting to get out of the rat race and climb over each other to get to the top, the essence of ‘team work’ can easily get lost. Honesty and loyalty are hard to come by and as such the notion of ‘trust’ gets trashed. Completely. From personal experience I can admit that I’ve been ‘screwed over’ more times than I care to remember. Friends, colleagues, employees, boyfriends, business partners, even family members… have promoted their own selfish needs and desires above the line of integrity and human kindness, and lost me in the process. Well more fool them. I’m no angel of course but we are all capable of justifying our own actions and behaviours to ourselves. It’s called survival, and self-belief is paramount to it. ‘Always put yourself first’ is a phrase many of us have heard, and been brought up with. I believe it was designed to instil a sensibility of survival, pride, self-love, integrity and self-protection. To a point it works. Until the self-indulgent narcissistic diva kicks in and then, well, if we were all affected, let’s face it, we wouldn’t be here, because we’d have either killed each other or failed to reproduce on a catastrophic level. All this considered, how is it then that team work, does in fact, make the dream work? Not one of us is here for ourselves. Collectively we serve a far greater purpose. Far bigger than any individual or organism. Life itself (or at least the creation of it) is dependent on team work… mostly a team of two rolling around having a heavenly time, and ‘thinking of England’. (Please read this sentence with your tongue in your cheek!). The world economy, money, is dependent on people communicating, working together, trading, making exchanges, and agreeing (even it takes several disagreements to reach a resolution). Survival, our health, and life longevity, is completely dependent on scientists working together, and working with patients to find solutions. Even our spiritual healers are reliant on their seniors for the acquisition of knowledge, and many will admit it is their team work with divinity that brings forth healing powers. Growth, of self, of nature, of life, requires an exchange of wisdom, a sharing of knowledge… ultimately, a formula, which is greater than one. The universe itself is forever expanding. Quantum physics will explain how this expansion both nurtures, and is nurtured by, team work. Energy starts with atoms, and for every action there is a reaction. Without a reaction (party number two), there is simply, nothing. No existence. So you see, team work does make the dream work, when you strip it back to its most basic purpose. Because without the team, there is no dream. The dream, I assume you’ve all gathered by now, is the magic and divinity of this thing we call ‘The Universe’. Take a moment to thank yourself, because without you, and your exact, unique and beautiful energy, we would not have existence. You are just as integral as every other being and organism in our multi-plex-verse, of which we know so little, but we do know, it takes a team to free a dream. We can’t do this on our own. Nor were we made to! 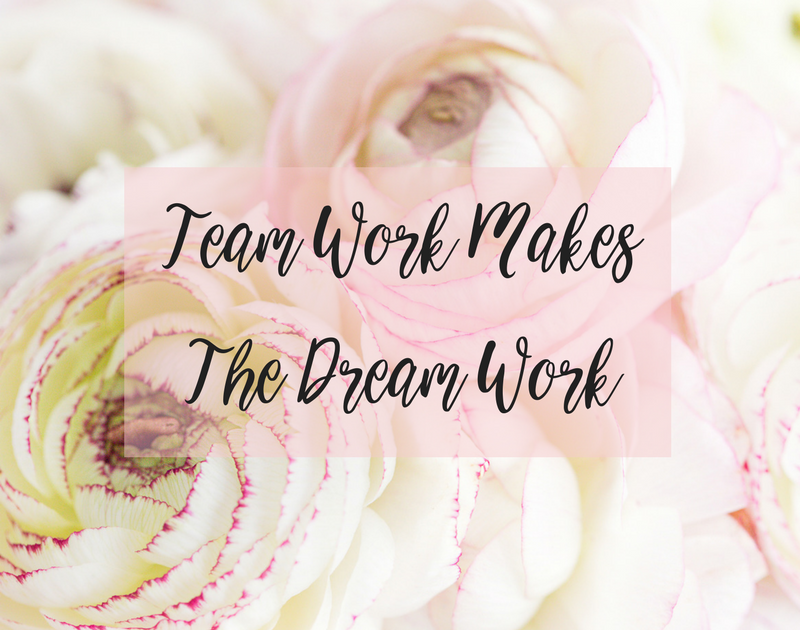 So next time you’re struggling, confused, in need of healing, or find yourself rejecting requests for help because you’re too self-absorbed in your own mini-verse, just remember… the more we work as a team, the more beautiful and expansive the dream. To my awesome team, I dedicate this one to you… you are the true definition of ‘universal family’. I love you.